Vince is the kind of person who likes to be in the heart of the action. From growing up in the suburbs to living in the city, today, he enjoys the variety that Chicagoland offers. 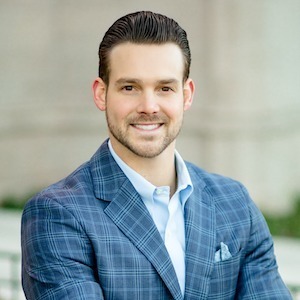 With his outgoing and friendly personality (you might even use the word charming), he loves being around people, and his passion for helping other has brought him success in the real estate business. He listens to the needs of his clients, and uses his passion and resilience to help them pursue their real estate goals, whether it is buying a condo in the city or selling and home in the suburbs. Vince has always loved the unique architecture in Chicago and has learned every doorway, arch, gate and window of the city from his study of different building styles. He’s traveled the length of the city, from the CTA to navigating the highways to the suburbs. He currently lives in Wicker Park neighborhood, where he enjoys trying new restaurants, bars, going to the beach and running and biking on the lakefront or 606 Trail. Vince’s clients love working with him—his enthusiasm is infectious. They know that he is their strongest ally through the home-buying and selling process, holding their hand throughout and fighting for their best interests. He also prides himself on educating his clients fully, so that every decision is made with thought and care. His passion and professionalism show in every relationship he creates. Call Vince for your real estate needs today. Vince studied at Wisconsin Parkside, where he earned a Bachelor of Science in Organizational Communication & Business, and played center-field on the baseball team. Greater Chicagoland - Down Town, Cook County, Lake County, McHenry County, etc. Call and I can help guide you down the right path.